This free toolkit can help your city attract new ideas, partners and resources to address its biggest challenges. 7 U.S. cities have already piloted the toolkit with great success. Rest assured: we will never share your contact information. Provide an email address to get access! Your work will be saved. You can return to it at any time with the magic button that was emailed to you. You may want several colleagues in the same department or across departments go through the toolkit individually, then bring everyone together to compare notes and reconcile responses. This approach can help bring to light data or resources one individual might be aware of, but others might not. It’s easy for experts to get caught up in the details of a problem and assume that more specificity is better in any procurement. Not so. Being too prescriptive can limit innovation and discourage solutions that generate wider benefits. The procurement toolkit takes a different approach to problem framing, and focuses on zooming out (using the Ansari X-Prize for commercial space flight as an example) to identify target outcomes and then to work backward to define what elements of the problem are most critical to solve. Often the easiest path through conventional procurement processes is to use Requests for Proposals (RFPs) and Requests for Quotations (RFQs). The benefit of these traditional approaches is that the language and legal framework are tried and tested. This is not a trivial thing in difficult-to-navigate bureaucracies. However, the downside is that many opportunities to improve outcomes are lost right at the beginning of the process. The toolkit matches cities and utilities to one of three specific “big city” procurement tools—Requests for Ideas (RFIs), design competitions, or performance contracts—and assigning a degree of difficulty that is the best fit for the problem at hand and the resources available. This is where many conventional procurement processes start: setting specifications. The toolkit offers clear guidance on what kinds of choices and specification decisions are likely to enable the most effective outcomes, and which ones are likely to discourage high-quality responses and innovative ideas or generate difficult-to-assess and hard-to- implement solutions. This work is the result of a collaborative initiative of re:focus partners and The Atlas Marketplace, funded with the generous support of the Kresge Foundation. Want to print the toolkit? Download a PDF version here. Tell your colleagues they should use the procurement toolkit for cities too! Getting the problem statement right is an essential first step toward procuring innovative, resilient, and cost-effective solutions. Framing a problem too broadly (e.g. address climate change) can be just as ineffective as framing one too narrowly (e.g. install solar panels on City Hall). Read this article for context. This is very important! The Local Water and Sewer Authority is seeking comprehensive, cost-effective, and equitable solutions to reduce the impacts of stormwater and riverine flooding in our community for vulnerable residents and small businesses by next spring (the rainy season). 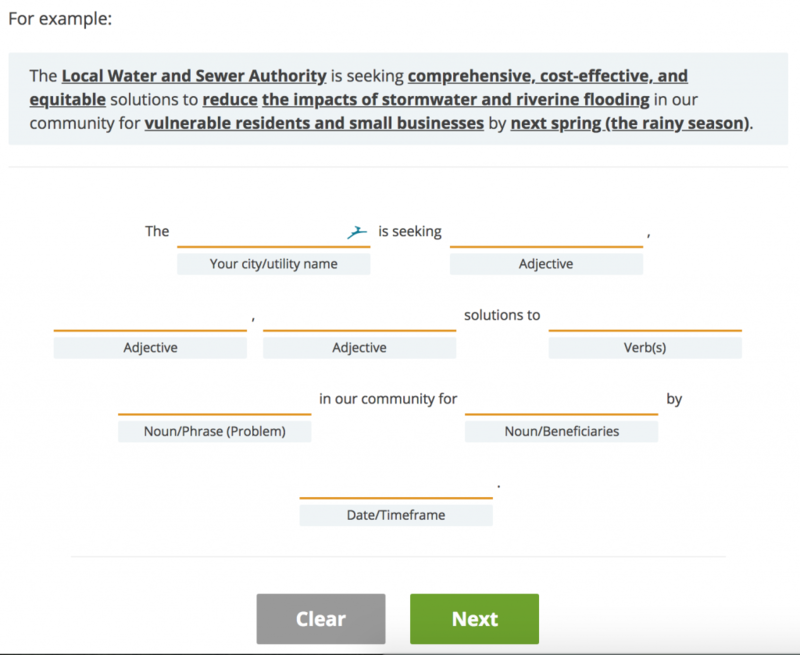 The Your city/utility name is seeking Adjective , Adjective , Adjective solutions to Verb(s) Noun/Phrase (Problem) in our community for Noun/Beneficiaries by Date/Timeframe . 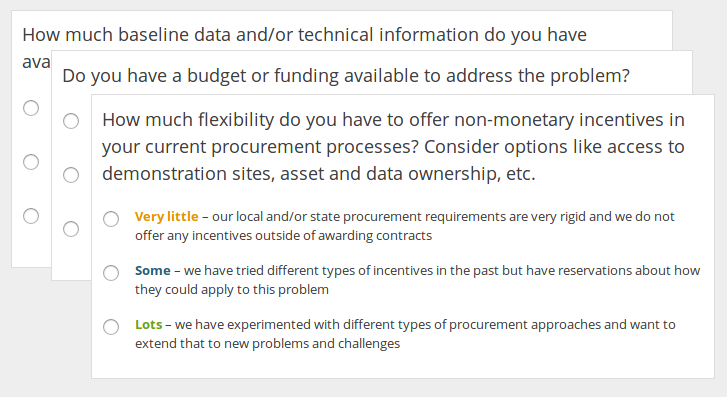 Next, identify the procurement tool that best matches both your problem and your available capacity/resources to address it by answering the questions below. You can always skip questions or change your answers later. Do not default to the lowest capacity or resource answer. Where possible, stretch for the response you think is achievable. Think beyond your own budget. (Are there are interdepartmental sources of support that you could recruit? Philanthropic funds?) Thinking this way requires more work up front, but can open up significantly higher value ideas, partners, and resources at the end. How much baseline data and/or technical information do you have available about the problem you are trying to solve? Do you have a budget or funding available to address the problem? How much flexibility do you have to offer non-monetary incentives in your current procurement processes? Consider options like access to demonstration sites, asset and data ownership, etc. It’s important to determine your local government’s capacity for addressing the problem you’ve described so that any eventual procurement process matches your city and/or utility’s time and resources to follow-through. Read this article (same one from the first section!) if you haven’t already. Seriously, read it. Pretty please. Take the short quiz below. You can always skip questions or change your answers later. What level of staff capacity is available to address this problem? How much internal technical capacity or external technical consultant support do you have access to for resolving this problem? What level of legal/finance/procurement expertise is available to your city/utility? 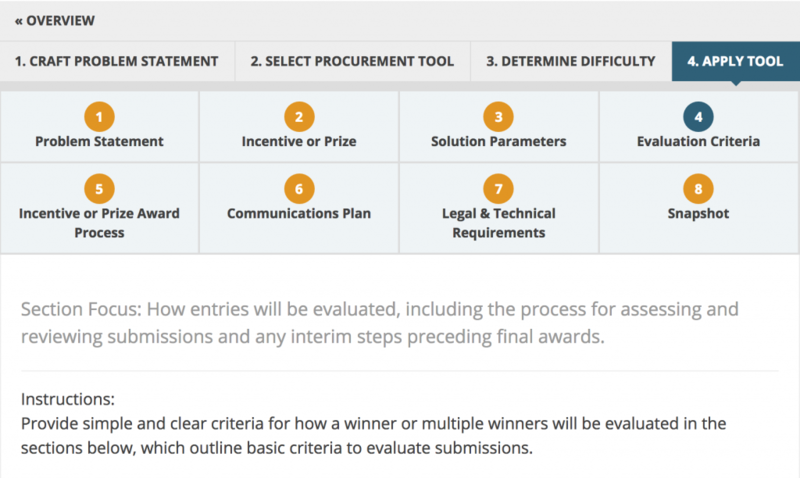 You need to select a tool and determine a level of difficulty before you can apply a procurement tool! Cities Seeking Innovation: New Toolkit Available!